I have not always been an avocado fan, in fact I would have to describe myself as anti-avocado in the past. My family would enjoy “alligator pears” with just a spoon and a smile while I gagged in the background. It was mostly a texture thing, I refused to eat salads that were slimed with ripe avocado or swampy looking guacamole. I started to tolerate small touches of avocado in sushi rolls, but only after scraping off any brown bits. After that slippery slope, I began sliding my tortilla chips into seven layer dip, trying to keep the green goo to a minimum. I finally leapt in and became an avocado convert after my talented husband, Exec Chef, made a chunky tomato heavy guacamole at home. I’d always known guacamole as greenish sludge that sat there limply until it turned brown and crusty. When I changed my perception and saw it more as a relative of salsa, which I eat by the sombrero full, it became a lot more appealing. Once that first batch ran out, I dared to make my own. I tweaked and seasoned until it tantalized my taste buds and then proceeded to demolish the entire bowl on my own. Since then I have hoarded avocados, impatiently waiting for them to ripen and then concocting bright fresh gloriously green guacamole! Cut the limes in half and squeeze the juice into a bowl. Cut the avocados in half and remove the pit. You can scoop out the flesh, but I like to peel them. 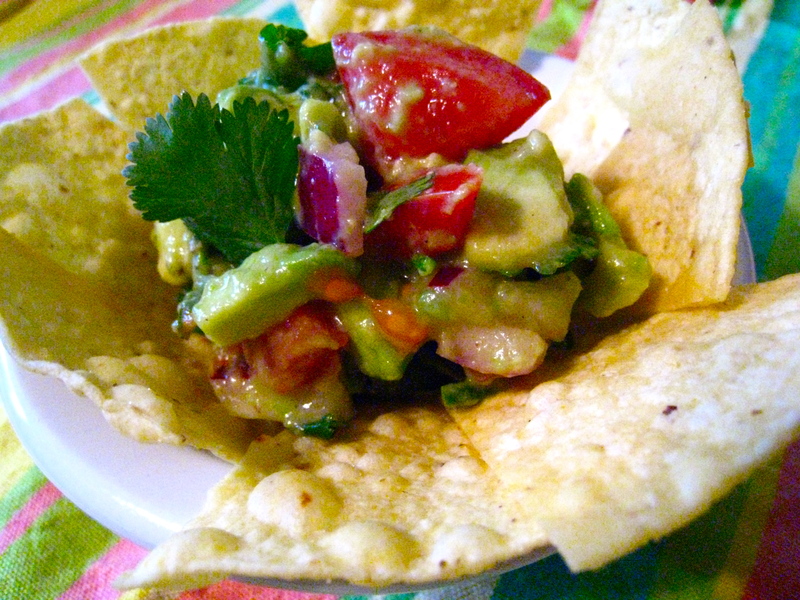 Chop up the avocado and add it to the lime juice. Dice the tomatoes and mix with the avocados and lime juice. Using a rubber glove (or a latex glove) on your non-knife holding hand, dice the jalapeño and add it to the bowl. Most of the heat is in the seeds, so leave some in if you like it spicy. Finely dice the onion and toss it in the bowl. Chop the cilantro roughly and add it to the bowl. 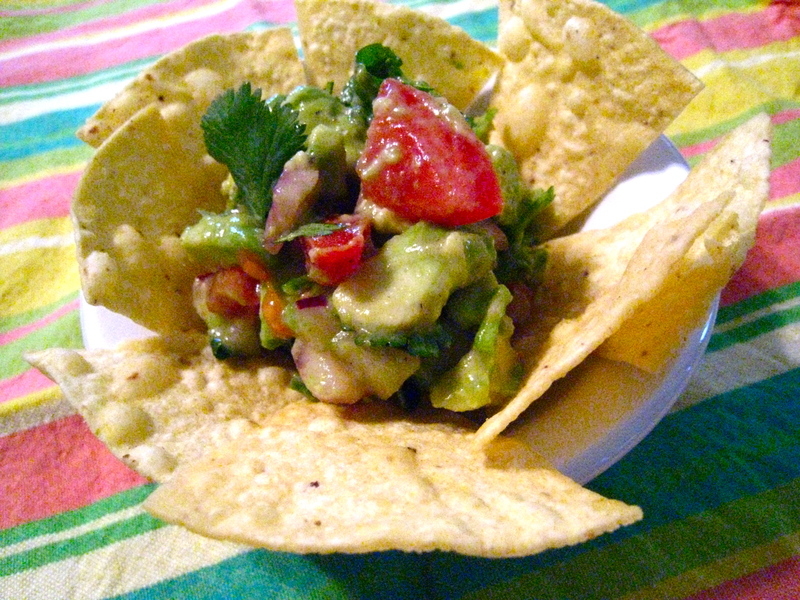 Posted in Kid Friendly, Recipes, Video and tagged appetizer, avocado, cilantro, dip, Mexican, party, tortilla. Bookmark the permalink.